Giveaway – my favorite knife! 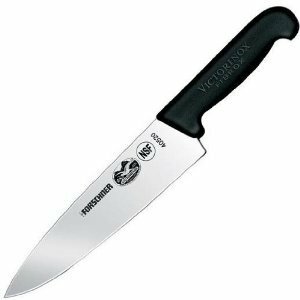 Win a Victorinox 8″ Chef’s knife! , and if I’ve learned anything in my cooking experience it’s that it is definitely true that you cut yourself more often with a dull knife than a sharp one. Also that if you chop a bajillion vegetables every week like me, you reaaaaaaallly want a good knife. 1. Comment on this post…you can say whatever you want, just make sure to include your email or website so I can contact you if you win! If you’d like, I’d love to hear about your favorite kitchen tool. 3. Like and post about Clean Green Simple on Facebook; again, you don’t have to mention the giveaway specifically, just post about the page or a favorite recipe, and let me know on my wall. I’ll leave this open until Monday (March 12, 2012) at 5pm PST, so you have the whole weekend to enter. Good luck! Congratulations! I’ll be emailing you to get your address, hope you love the knife! Disclaimer: I’m pretty confident that Victorinox has no idea who I am, and they certainly didn’t sponsor this giveaway. I’m doing this all on my own because I love that people actually read this blog and I feel like sharing the love. Also because this knife is rad. I love me a good kitchen knife. I totally have a favorite, and will pull it out of the dishwasher to use it. That doesn’t mean I wouldn’t love a new one to try out! I would love to win that knife. My immersion blender is my favorite kitchen tool to make smoothies to cream soups. I’m pretty sure this would make my kitchen 100 times safer! My knives never seem to stay sharp and aren’t of very good quality. How awesome of you to host this giveaway! By the way, right now my favorite kitchen utensil is my thin bamboo spoon. It’s actually my boyfriend’s but migrated to my apartment.. Next comes Leon, my food processor! I love my kitchen knife!! Really glad that your blogging again! So glad to see you back! I only started following a few months ago, so I’ve had some time to trawl through your old posts, and I was so excited to see new ones! I love a good crepe pan. Perfect size when cooking for one. The handle broke off of my best chopping knife the other day! That can’t be good. I have to agree with you, though: no need for a third reason when you find a perfect knife that works well and doesn’t break the bank. Besides a good chef’s knife, the kitchen utensil I use the most is my heat resistant rubber spatula. Thanks for offering the giveaway and advice about this knife. I’m in desperate need of a new knife! My mother-in-law was just out visiting and would joke that it would be easier to use a spoon to do all our chopping. I love my Kitchenaid mixer. I just got it about a month ago and now I can’t wait to make something if it requires much kneading so I don’t have to do it anymore. I’d like to win. I also posted you to my Pinterest. My favorite kitchen tool would be my VitaMix blender. I’d really like to win a lovely knife. I pinned your tool to my Pinterest page. My favorite kitchen tool is my VitaMix blender or maybe my above the stove microwave/convection oven. Ohhh, I love your blog and I would also love a new kitchen knife. As we have recently changed our diet to be mainly plant based , I, too, am chopping a bazillion fruits and veggies a day. I good knife is certainly a necessity. Thanks for your blog. 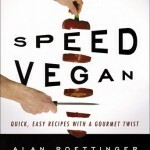 I have tried many recipes from here in a successful attempt to get my family to eat their veggies. You’re so rad and it’s nice read your posts again. What girl wouldn’t love an awesome knife in their kitchen? Thanks for the chance to win! I am in desperate need for a good chef’s knife. Mine is in direly need for replacement! I liked this on your Facebook page! Love your blog, glad you’re back! When it comes to cooking, I couldn’t live without my pressure cooker! Good knifes make cooking so much easier! You’re very sweet to offer this giveaway! My favourite kitchen utensil, maybe my ice cream/cookie scoop that I use for drop scones, cookies and muffins. I’m glad you’re back! This blog has been a wonderful reference for me! Thank you! I “”Like” and posted about you on my FB as Manda Valenti! Hi Jessica! I recently discovered your blog and I am absolutely in love with these recipes. I have already tried the mushroom asparagus risotto and it was a major hit with my family. I am already lining up recipes for the weekend, including the raw strawberry chocolate tarts. I’m thankful to have so many delicious, gluten-free, vegan recipes to choose from – you’re amazing. I love my microplane grater. Held out for years and now don’t know why I didn’t buy one sooner. NOTHING is better than having that perfect knife to use. I never thought I needed a food processor and now I can’t imagine life without one. I use more often than I ever thought possible. My hand/stick blender…..I use it for so many things! I’m glad you are back! And I could use a replacement knife, with spring on its way and my CSA produce, too! And I do need a new knife. Lovely looking knife! Great give-away. I just stumbled across your site. Looking forward to all you have to offer. Looks amazing. My favorite tool has to be my, hmm, so many to chose from. I guess right now I am loving my mandolin. Not sure why I waited so long to get one. Great giveaway! I always say a good knife is the best kitchen tool, but I really need to invest in a really nice knife. The one I use is/was great quality, but it’s probably as old as I am! I’ve been looking for a great knife- mine are all dull and cheap to begin with. I finally got a decent knife a few years ago when I moved in with my boyfriend and it’s amazing how much of a difference it makes. Hello! I would love to win this knife as my other one has been sent back to the manufacturer and I am using serrated ones at the moment haha! I’ve used several of your recipes and I love them! Keep sharing! My favorite kitchen tool is a toss-up between my Microplane ester and my Cuisinart mini processor. I don’t even own an 8″ chef’s knife and would love to win this one! This is such a generous giveaway! A good sharp knife makes cutting fruits and veggies so much better! Great Blog! My favorite “kitchen” tool is the coconut scraper my neighbor brought me from the Philippines. Getting the meat out of my coconuts takes two seconds, and here in hawaii there are a lot of cocos to scrape. Do you have a coco favorite recipe? I’m just now moving from LA to NY and will have to fill my kitchen with new tools. First on the list is a good knife. I would love to have a nice knife to keep at either my place or my boyfriend’s so that I don’t have to tote knives back and forth every day! I love hearing about kitchen tools and am always in the market to try new ones!! Hi Jessica, this knife looks great! Would love to give it a try. So glad you’re back with all your wonderful recipes and tips! Thank you so much! I’m really excited to try this out. I know my whole family will appreciate having a great knife.